In most themes, the sidebar and footer are so called widget areas. 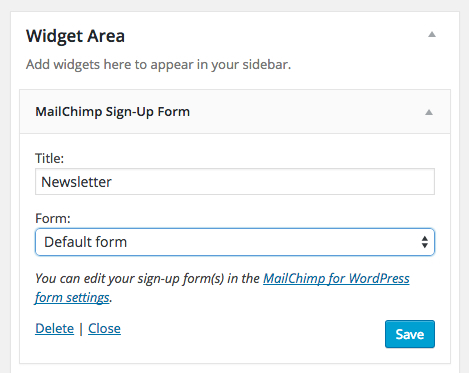 This means that you can use the dedicated “MailChimp for WP Form” widget to show a sign-up form in these areas. To add this widget to your sidebar, go to Appearance > Widgets and select the MailChimp for WP Form widget. Then, drag it to one of the available widget areas. Select the form you would like to show and visit your site. Your form should now show in the widget area you selected.